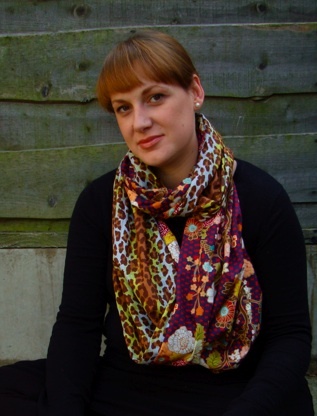 This week I was delighted to be able to test Rebecca of Making Rebecca Lynne's new pattern for infinity scarves. She has cleverly devised one pattern for 3 different versions - The Skinny, The Hood and The Mama. All gorgeous, simple to make and so stylish!! The beauty of these is there's so many options and they would look completely different depending on the fabric you chose. I used 3 fat quarters that I absolutely love but had no specific plans for. One was from the stale stash swap with the fabulous Danny and the other two are Swallow Skies in Storm and Little Bits in Honey from 'The Birds and The Bees' by Tula Pink. I had bought these two prints especially for this project because I love them so much! They are Spotted in the Crowd in Amelia from 'Field Study' by Anna Maria Horner and Marqueterie in Berry from 'Indie' by Pat Bravo. The pattern actually shows 6 different fabrics for this scarf (so easy with fat quarters!) but you can really adjust it to what you have or the fabrics you chose to work with. I am so super happy with both of my scarves and they really make me smile when I wear them! I can not recommend this pattern enough, I absolutely give it 5 stars! A beginner could easily make these scarves and an accomplished sewer would find so many great options with it... I'm totally thinking some embroidery would make a nice addition too! You don't even need a sewing machine if you wanted to hand sew them. I used a machine for all the seams except the final closing, which I hand sewed using a ladder stitch. I will totally be making more of these and they will be great to give as Christmas presents. Someone is going to be very lucky because Rebecca is giving away one of her patterns... head on over to Making Rebecca Lynne and enter to win! You can also get details of how to buy the pattern. Please show her some love and support her amazing creativity. And then don't forget to enter my Kona giveaway to win 4 fat quarters of Kona solids and a Kona colour card - kindly sponsored by Fluffy Sheep Quilting and open to everyone! Thank goodness that 'kid' didn't see the mean gangsta! ha ha! Very funny out takes...and a great scarf! love the photos! You had me giggling! Look at you Miss Gorgeous - love the cheek face sneaking in and the Hood is my fav! 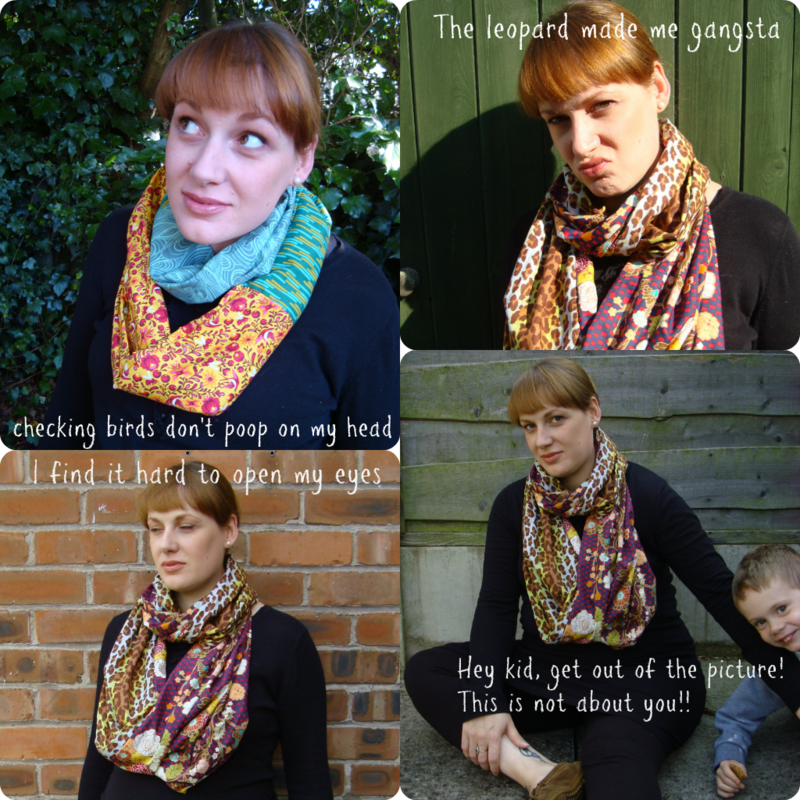 Love your scarf and the pictures with captions! I made a tonne of voile/flannel infinity scarves for pressies last Christmas. But might have a go at making one with more than two fabrics. You rock the gangsta look. :) The infinity scarf looks lovely. Gonna have to try me one of those! Great photos!! Oh, and the scarves are great, too! Lucy, you are so cute! I am always having to push kids out of my pictures, too. Except i'm usually taking pictures of fabric, not myself! you've made me smile with your photo shoot! And love that pregnant belly! You're adorable! Lovely scarves, they really show off that belly in all it's pregnant glory! The scarves are lovely. I like them all ! I love that leopard print scarf so much! Loving the outtakes! Hahaha @ gangster! :) The scarves are gorgeous! the scarves are lovely, looks like the pattern is a lot of fun. Great scarves! Loving the photos - particularly the outtakes hehe!! Gorgeous scarfes and great photo's - you are positively blooming!! Hi Lucy, love your work! Absolute ditto what Janine said. Love the scarves. Bump is looking great!